Professor Dominic Dwyer is looking forward to his new role. Congratulations to Professor Dominic Dwyer who has been appointed as the NSW Health Pathology Local Pathology Director at Western Sydney Local Health District (WSLHD). 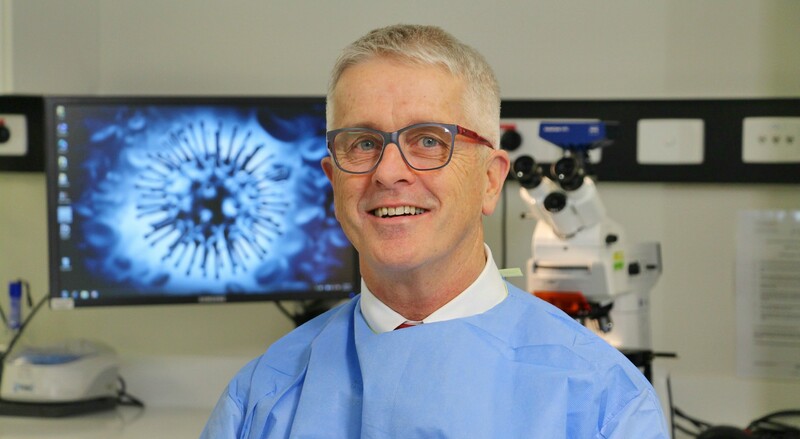 Located in the Institute of Clinical Pathology and Medical Research (ICPMR) Laboratory in Westmead Hospital, Professor Dwyer is responsible for ensuring the connectedness of pathology with other clinical services in the LHD. “I’m really excited to be appointed to this new position,” Professor Dwyer said. “Pathology is a crucial clinical service. Our intent is to build local pathology teams that are best placed to remain responsive to the evolving needs of the hospitals and communities we serve across the state and including here in western Sydney. “As part of this, I’ll be working more closely with hospital clinicians and executives to ensure pathology helps with the management of patients in the ‘hot zones’ of the hospital, and for patients attending the hospital with chronic medical conditions. An important part of Dominic’s role is assisting state and national governments in planning for pandemic influenza and emerging infections. The laboratory here at Westmead is actively involved in disease outbreak investigations. He also manages statewide pathology services in public health, which includes running a World Health Organisation National Influenza Centre here at Westmead. “These statewide public health laboratory services benefit everyone locally, around NSW and nationally,” Professor Dwyer said. “I strongly support research and encourage innovation because I believe these underpin good pathology practice and good clinical medicine. Professor Dwyer is a medical virologist and infectious diseases physician. He has been working in AIDS clinical care since the beginning of the AIDS epidemic and has contributed to clinical antiviral and vaccine studies. In addition to his Local Pathology Director Role, Dominic is also the Director of Public Health Pathology for NSW Health Pathology. He is Director of NSWHP’s ICPMR lab at Westmead Hospital, a Clinical Professor at Sydney University, and part of the Marie Bashir Institute for Emerging Infectious Diseases and Biosecurity. Dominic can be contacted on 8890 6076 or dominic.dwyer@sydney.edu.au.